Izzy Goldstein pitched 56.1 innings for the Detroit Tigers in 1932. Czarist Russia was a nasty place for anyone Jewish. Government pogroms (Russian for “harm” or “destruction”) led to rioting and to thousands of injuries and deaths. Cruel orders such as the May Laws added more burdens to an already difficult life. Decreed by Alexander III in May 1882, the laws prohibited Jewish residents from settling in agricultural areas, forcing them into urban ghettos. May Laws also created a quota system in higher education and for professional jobs. Many Jewish residents fled Russia for a better life. William and Ida Goldstein, along with their three children, escaped from Odessa, Russian Federation (present-day Ukraine). Isidore Goldstein was born June 6, 1908, not long before his parents and siblings left for New York City. Izzy mostly grew up in the Bronx and graduated from James Monroe High School. The product of a faraway place, Izzy quickly picked up on the American game. Not much of a student, he preferred to play baseball. A 6-foot-tall, slender right-hander, Izzy hurled a powerful fastball. The Detroit Tigers liked him and signed him. They assigned Izzy in 1928 to the Wheeling, West Virginia, Stogies of the Class C Mid-Atlantic League. Young Goldstein went 12-9 with a 3.61 ERA. Izzy followed up that campaign by going 12-8 and 2.74 ERA for the Evansville, Indiana, Hubs of the Three-I League in 1929 and 14-11 with a 3.52 ERA, in 1930, again for Evansville. The pitcher packed his bags for sunny California the next season. The Los Angeles Angels of the Pacific Coast League wanted him. In the end, though, Izzy pitched in the Texas heat in 1931 for the Class A Beaumont Exporters. The Detroit Tigers invited Goldstein to spring training in 1932. He pitched well; the Tigers sent him back to Beaumont, anyway. There, Izzy put up his best numbers yet. He started the season by going 6-1 with a 1.58 ERA. Those stats were impressive enough for the Tigers brass. Izzy boarded a train, headed for the major leagues. He pitched his first game for the Tigers on April 24, 1932, against the Chicago White Sox. He got in only one inning of work, in relief of starter George Uhle, who was rocked for five earned runs in just two innings. Izzy gave up just one hit, and he struck out a batter. Unfortunately, he allowed three walks, and that led to another Chicago run. Of note, the White Sox led 9-2 going into the bottom of the eighth inning, but ended up blowing that sizable advantage. The Tigers scored four runs in the eighth and another four in the ninth to win 10-9. On May 24, Goldstein earned his first big-league win. He started in Detroit against the St. Louis Browns. Izzy gave up single runs in the first and second innings, but the Tigers came back with two runs apiece in the third and fourth. St. Louis answered with a run in the fifth, while Detroit scored two more times in the seventh. Goldstein allowed two runs in the eighth before getting the hook. The Tigers held on to win 6-5. In his 7.1 innings, Izzy gave up 10 hits, walked six and struck out two. He was charged with all five St. Louis runs. Considering that he allowed 16 base runners, it could have been worse. Izzy’s best game as a big leaguer came June 27 at Comiskey Park in Chicago. He scattered five hits and gave up three runs, one in the first and two in the seventh, as the Tigers beat the White Sox 9-3. Izzy upped his won-loss record to 3-1 as the Tigers improved to 37-27 on the season. The 24-year-old even lowered his ERA to a solid 2.75. And, he never started another game. Maybe it was the five walks. Goldstein was never one for pinpoint control. Izzy’s last game came exactly one month after his best game. He pitched in relief of starter Earl Whitehill, against the Philadelphia A’s. Walks got him again. He gave up two free passes in two/thirds of an inning, to go along with two hits, and allowed two runs. The Tigers sent their rookie to pitch for the Toronto Maple Leafs of the International League. Izzy Goldstein never pitched another game in the majors. He logged time with Toronto and at some point, he did what pitchers tend to do. He hurt his arm. That only earned him his release from the Tigers. Izzy pitched a little bit and played outfield for some semipro teams in New York, hoping to hook on again in the majors. It never happened. He retired from the game in 1938. For a while, he sold men’s suits. Then, World War II broke out. Izzy, a single man, got a draft notice in the mail and served in the South Pacific. When the war ended, he went back to selling suits. Izzy eventually got married. He and the former Carol Levine moved to Florida. Erwin Lynn included Izzy in the book The Jewish Baseball Hall of Fame: A Who’s Who of Baseball Stars. Goldstein pitched in 16 games in the majors. He started six times and tossed two complete games. His ERA ended up at 4.47 over 56.1 innings. He allowed 61 hits and struck out just 14 batters. Most telling, he surrendered 41 walks. Izzy Goldstein died on September 24, 1993, at the age of 85. He is buried at the Jewish Eternal Light Memorial Gardens in Boynton Beach, Florida. Tiger Stadium went by Briggs Stadium from 1935 to 1961. They’re going to play baseball again at the corner of Michigan and Trumbull in Detroit. Construction is scheduled to begin in April on a youth sports center where Tiger Stadium once stood. The new headquarters of the Detroit Police Athletic League (PAL) will feature a baseball field, as well as a field for soccer and football. The $12 million facility, located in the city’s historic Corktown neighborhood, will be 9 ½ acres. A mixed-use development, called The Corner (one of the nicknames for Tiger Stadium) also is part of the construction plan. Tiger Stadium opened April 20, 1912, as Navin Field, named for then-owner Frank Navin. The steel-and-concrete park, which cost $300,000 to build, opened the same day as Fenway Park in Boston. Navin Field replaced Bennett Park, also located at Michigan and Trumbull avenues. Following Navin’s death in 1935, Walter Briggs bought the team. He renamed the park Briggs Stadium, Seating capacity increased from 23,000 to 36,000. A few years later, 17,000 more seats were added. Mike Ilitch, the head of Little Caesars Pizza, bought the Tigers in 1992. He made some cosmetic changes to Tiger Stadium and began working on plans for a new park. The Tigers played their last game at Michigan and Trumbull on Sept, 27, 1999. They beat the Kansas City Royals 8-2. Comerica Park opened April 11, 2000, at 2100 Woodward Ave.
Detroit first baseman Johnny Neun turned an unassisted triple play against the Cleveland Indians on May 31, 1927. Detroit fans gave the St. Louis Cardinals’ Joe “Ducky” Medwick a fruit-filled shower in Game Seven of the 1934 World Series. The fans didn’t like the way Medwick slide into Tigers third baseman Marv Owen earlier in the game. New York Yankees sluggers Babe Ruth notched home run No. 700 on July 13, 1934. The ball sailed over the right-field and supposedly traveled more than 500 feet on the fly. Joe Louis defended his heavyweight title by knocking out contender Bob Pastor Sept. 20, 1939, in the 11th round. The Boston Red Sox’ Ted Williams belted a three-run homer to win the 1941 All-Star game 7-5. The Tigers and Yankees slugged a combined 11 home runs on June 23, 1950. The Tigers won the game 10-9. The Washington Senators’ Frank Howard, the Capital Punisher, cranked his 10th home run in a six-game span on May 18, 1968. Not surprisingly, the 6-foot-7 Howard belted the ball onto the roof. Detroit ace Denny McClain beat the Oakland A’s on Sept. 14, 1968, to win his 30th game of the season, the first pitcher to reach that milestone since Dizzy Dean in 1934. Reggie Jackson crushed a home run off Dock Ellis during the 1971 All-Star game. The ball plastered a light-standard transformer on the right-field roof. Detroit phenom Mark Fidrych talked to the baseball at Tiger Stadium and everywhere else he pitched. Fidrych fashioned a 19-9 won-loss in his rookie season of 1976. Arm problems followed. He retired with a 29-19 career record. Walt Dropo enjoyed his best season with the Boston Red Sox in 1950. He later played for the Detroit Tigers and other teams. 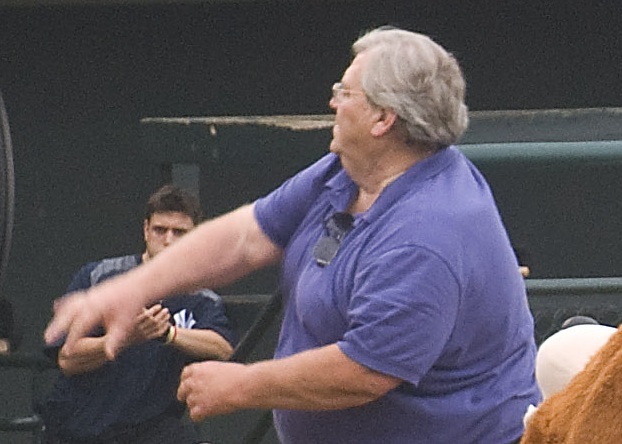 Walt Dropo stood 6-feet-5 and weighed 220 pounds, a giant of a man in 1950s baseball. Dropo pounded baseballs in the first year of that decade, his rookie season. He looked as solid and as powerful as a brand-new Chevrolet. “The Moose” from Moosup, Conn., tied Boston Red Sox teammate Vern Stephens for the American League lead in RBI with 144. He slammed 34 home runs (second to Al Rosen’s 37), hit .322 (eighth in the league) and slugged .583 (runner-up to Joe DiMaggio’s .585). Not surprisingly, the writers voted Dropo the A.L. Rookie of the Year. The right-handed hitter finished sixth in the league in the MVP race. Did the Red Sox have yet another slugger on their hands? Someone to go with Stephens, Bobby Doerr and the great Ted Williams? Not really, as it turns out. The first baseman never again posted the big-time numbers that he did in 1950. He played 13 years and cranked 152 home runs. He hit .270 lifetime with a .326 on-base percentage and .432 slugging percentage. The one-time All-Star (1950, of course) accumulated 3.5 career oWAR points (baseball-reference.com), 3.1 of them in his first full season. The Moose, born Jan. 30, 1923, hailed from a family of immigrants. His parents were born in present-day Bosnia and Herzegovina in southeastern Europe. Savo and Mary Dropo settled with their family of five children on a one-acre farm in rural Connecticut. Young Walt milked cows, bailed hay and chopped wood. The young man grew up big and strong. He earned a football scholarship to the University of Connecticut and also served in World War II. Cpl. Dropo mostly helped rebuild bridges in Europe for the Army Corps of Engineers. Following the war, Dropo returned to UConn and athletic glory. Finally, he had a choice to make: Play pro baseball or play in the NFL for George Halas and the Chicago Bears. (Halas knew a big, athletic guy when he saw one.) The Red Sox and owner Tom Yawkey offered Dropo a tryout and, after Dropo peppered line drives all over Fenway Park, offered him a fat check. Yawkey’s money beat out Halas’s. The promising ballplayer broke a wrist in 1951 and was never the same. He hit just .239 that season with 11 homers in 99 games. Dropo played only 37 games for the Red Sox in 1952 before being traded to the Detroit Tigers in a nine-player deal on June 3. In his 115 games with the Tigers, Dropo slammed 23 homers after hitting six in Boston. That combined total of 29 would be the second-best mark of his career. Dropo drove in 96 runs for the ’53 Tigers and smacked 19 homers for the 1955 Chicago White Sox. Dropo struggled over the last several years of his career. He hit 13 home run for the White Sox in 1957, the last time he would reach double figures. The Baltimore Orioles released Dropo on May 20, 1961. In his post-baseball career, Dropo did quite well for himself. He worked in real estate and several other business ventures, including a successful family fireworks company. Moose also made community relations appearances on behalf of the Red Sox. This is also of note: In part due to his ethnic roots in Serbia, Dropo held a sympathetic spot for minorities in baseball. He was friends with White Sox teammate Minnie Minoso, for instance, and went to a Nat King Cole concert with Larry Doby. Once, Dropo got into a fight with the St. Louis Cardinals’ Enos Slaughter after Slaughter began race-baiting Doby at Comiskey Park. Big Wally Dropo wrestled Slaughter to the ground and put a quick end to the nastiness. Dropo died Dec. 17, 2010, at the age of 87. Ty Cobb played 24 seasons in the major leagues, 3,034 games. Every game was a battle, every season a war. “Cobb was pursued by demons,” MLB historian John Thorn has said. Born Dec. 18, 1886, in Narrows, Ga., Tyrus Raymond Cobb grew up the son of a school-teacher dad and wealthy mom. Young Ty idolized his dad, who wanted his son to study law or medicine, not play baseball. The game fascinated young Cobb, though, and he began trying out for various semi-pro clubs. He figured to make it big as a ballplayer and make his dad proud. On Aug. 8, 1905, Amanda Cobb fatally shot her husband, William Herschel Cobb. Charged with murder, Mrs. Cobb was later acquitted of the charge. W.H. Cobb had suspected his wife of adultery. He left home one night and hoped to sneak back and catch his wife in an act of infidelity. Amanda Cobb shot her husband when she saw a silhouette in the window. “He never got to see my play,” Ty Cobb always said. One of the greatest players ever—maybe the greatest ever—competed with a sense of fury in large part because of what happened on that humid August night in 1905. This is a summary of the life of Ty Cobb. Cobb batted .240 (150 at-bats) in his rookie season of 1905. He hit at least .316 in every season after that. The Georgia Peach won 12 batting titles over his 24-year career (1905-23). He topped the A.L. in hitting every year from 1907-15 and from 1917-19. Cobb took home the Triple Crown in 1909. He led the league with nine homers, 107 RBI and a .377 batting average. In 11 seasons, Cobb drove in at least 90 runs without reaching double digits in homers. His single-season high mark in home runs was 12 (1921 and 1925). Cobb always played the game hard. He famously cut the arm of Philadelphia A’s third baseman Frank “Home Run” Baker after sliding on a close play. Death threats from riled-up A’s fans followed. “The great American game should be an unrelenting war of nerves.” – Ty Cobb. Cobb put together his lone MVP season in 1911. That year, he led all A.L. players in runs scored (147), hits (248), doubles (47), triples (24), RBI (127), batting average (.420), slugging percentage (.621), OPS (1.088), OPS+ (196) and total baes (367). He finished second in homers (eight) and on-base percentage (.467). Cobb’s regular-season heroics did not extend into the post-season. He hit .200 (4-for-20) in the 1907 Series, .368 in 1908 (7-for-19) but just one extra-base hit, and .231 (6-for-26) in 1909. The Tigers lost all three Series. Cobb served as player-manager for Detroit from 1921-26. His squads compiled a 479-444 (.519) mark and finished as high as second place (83-71-1) in 1923. When he retired, Cobb held the major league records for games played (3,035), at-bats (11,434), runs scored (2,246), hits (4,189), total bases (5,854) and batting average (.366). He held the 20th century mark for most career stolen bases (892). All told, Cobb led the league in OPS 10 times, hits and slugging percentage eight times, on-base percentage seven times and stolen bases six times. Cobb left baseball a wealthy man. He owned thousands of shares of Coca-Cola, along with three bottling plants. He helped build the Cobb Memorial Hospital in Royston, Ga., (now part of the Ty Cobb Regional Medical Center) and the Cobb Educational Fund for needy college-bound students. In 1936, Cobb received more votes than any other player on the Baseball Hall of Fame’s inaugural ballot. Writers gave him 222 of 226 possible votes (98.2 percent). “You’ve got to remember, I’m 73.” – Ty Cobb later in life, explaining why he might hit just .300 against the day’s pitchers. Cobb died July 17, 1961, at the age of 74. He is buried in Rose Hill Cemetery in Royston, Ga.
Denny McLain made winning look easy in 1968. He did it more than 30 times. He challenged hitters with right-handed fastballs and sliders. He stood on the mound, the brim of his cap turned low, and looked into catcher Bill Freehan for the sign. McLain, in the Year of the Pitcher, compiled a 31-6 won-loss record with a 1.96 ERA (154 ERA+). He completed 28 of his 41 starts and threw 336 innings. The writers voted him both the American League Cy Young Award winner and the league MVP. McLain was just 24 years old, already in his sixth big league season. The following year, 1969, he finished 24-9 with a 2.80 ERA (134 ERA+). McLain completed 23 games and hurled nine shutouts. (He tossed six shutouts in ’68.) Once again, the writers voted him the A.L. Cy Young Award. This time, he ended up sixth in the MVP voting. At this point, he sported a 114-57 career won-loss record (.667 winning percentage). Then, Dennis Dale McLain made a mess of things. He played just three more seasons. The young veteran struggled to go 17-34 (.333), the victim of a sore arm and his own foolish decisions. Once, the future looked so promising for McLain. Detroit brought him up to the big club late in the 1963 season. The Chicago native and Mount Carmel High School graduate went 2-1 in 21 innings. The next year, he finished 4-5 in 100 innings and followed that by going 16-6 with a 2.61 ERA (134 ERA+) in 1965. McLain’s ERA soared to 3.92 in 1966. He still went 20-14 and made the All-Star team, thanks in large part to a 13-4 start. McLain faded again in ’67. He won 17 games but none after Aug. 29. He put up another pedestrian ERA, too, 3.79. McLain said his problems began that year when he stubbed two toes after hearing some raccoons making a ruckus outside his house. Detroit teammates insisted that McLain hurt his foot by kicking a water cooler in the dugout. The Tigers lost out to the Boston Red Sox in the pennant race. Detroit easily won the pennant in 1968, going 103-59 and finishing 13 games ahead of the second-place Baltimore Orioles. McLain won his 30th game on Sept. 14, a 4-3 decision against the Oakland A’s. He won his 31st game less than a week later. No pitcher had won 30 games since Dizzy Dean did it for the 1934 St. Louis Cardinals. The Tigers played the Cardinals in the ’68 Series. Detroit won the Series in seven games, but St. Louis ace Bob Gibson got the best of McLain. Coming off an incredible season highlighted by a 1.12 ERA over 304 innings, Gibson went 2-1 with a 1.67 ERA against the Tigers. McLain went 1-2 with a 3.24 ERA. Not surprisingly, McLain hit the banquet circuit—hard–in the fall of 1968 and winter of ’69. He signed endorsement deals, did talk shows and ended up in Las Vegas a time or two. He did the same thing the next year. Trouble inevitably followed. Sports Illustrated published a story in 1970 titled “Denny McLain and the Mob, Baseball’s Big Scandal.” The text was even worse than the headline. McLain, the article alleged, had fallen in deep with the Syrian mob in Flint, Mich. Not long afterward, the pitcher filed for bankruptcy, a $200,000 salary notwithstanding. Baseball Commissioner Bowie Kuhn put down the hammer. He suspended McLain for nearly a half-season. McLain came back July 1, but on Aug. 28, he tossed a bucket of ice water on top of some local sports writers. The Tigers’ brass didn’t get the joke. McLain was suspended for seven days. Just a few day later, Kuhn found out that McLain had carried a gun onto a team flight earlier in the year. The commissioner told McLain to sit down. McLain ended the 1970 campaign with a 3-5 won-loss record and a 4.63 ERA. Detroit, to no one’s surprise, traded McLain in the offseason. The Washington Senators, to everyone’s surprise, picked him up. McLain and Washington skipper Ted Williams, to no one’s surprise, hated each other. McLain, winner of 31 games just a few years before, led the A.L. in losses in 1971. He went 10-22 with a 4.28 ERA (77 ERA+). By the end of the 1972 season, split between Oakland and Atlanta, McLain was out of major league baseball. His career record stood at 131-91. He was 29 years old. His troubles continued. He said his arm hurt, but he was out of shape. He kept putting on weight. He drank one Pepsi cola after another. McLain made several business investments. Almost all of them were bad. He filed for bankruptcy again. Supposedly, he did some loan sharking. One story is that he flew his airplane out of the country with a fugitive in the passenger seat. The U.S. Justice Department filed a bunch of charges against him (racketeering, cocaine trafficking, etc.) and got enough of them to stick. A judge sentenced McLain to 23 years, but the ballplayer only did 30 months. An appellate court threw out the case. In 1993, for reasons known but to God or the Devil himself, McLain and a buddy bought an old meat-packing company in Michigan. Pretty soon, $3 million was gone from the company’s pension fund, and the feds wanted to know why. McLain faced another round of charges and spent seven years in a jumpsuit. This is Denny McLain post-1969 in a nutshell: In 2011, the former pitcher took the wrong exit and accidentally drove into Canada from Michigan. He turned around, but, he had to go through U.S. Customs on the way back. Lo and behold, McLain had an outstanding warrant. He sat in jail for a week before being released.